What are brassicas? Brassicas are a group of vegetables in the mustard family including broccoli, cauliflower, cabbage, brussels sprouts and kale. Brassicas thrive in areas with moderately cool springs and autumns. Even if you live in a region with hot summers, you can successfully harvest brassicas twice a year: in the early spring before the summer temperatures peak and in the fall. 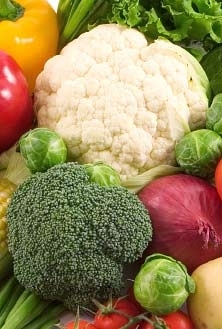 Broccoli and cauliflower like cool temperatures, full sun, sandy soil and slightly acidic to neutral soil pH. Broccoli is hardy and can germinate in cold weather as low as 40º F. Fall planting is recommended if you live in a warm climate. Cauliflower, not the hardiest of brassica plants, can tolerate a minor frost, but a hard frost can kill your entire crop. Cool, moist conditions are ideal. Brassica seeds can either be started indoors and transplanted outside or sown directly into the ground. To enrich the soil, work in 2 to 4 inches of rich compost before planting. Most brassica vegetables are susceptible to pests and diseases such as aphids, cabbageworm, clubroot and black rot. Talk to your local Southern States gardening expert for ways to avoid and eliminate these pesky gardening problems. For a spring crop, sow broccoli seeds directly in the garden two to three weeks before the last spring frost date. For fall planting, sow seeds directly in the ground 85 to 100 days before your region's typical first frost. Plant the seeds 1 inch deep and 3 inches apart. Space transplants or thin out your seedlings 12 to 24 inches apart based on maturity size. Broccoli is ready to harvest 45 to 60 days from sowing depending on the variety and growing conditions. To harvest, cut when the broccoli head is still tight and compact before the flower buds open. Cauliflower will perform better if you start your seeds indoors and then transplant outdoors when the seedlings are about 6 weeks old. Transplant in the garden 2 to 3 weeks before the last spring frost date. Space the seedlings 18 to 24 inches apart with 30 inches between rows. For fall planting, use the same timetable as you would for fall cabbage. Cauliflower is ready to harvest 30 to 80 days from sowing depending on the variety and growing conditions. To harvest, cut off just below the head when the buds are still tight and unopened leaving a few leaves for protection. Both broccoli and cauliflower require moist soil conditions. Regular watering is necessary, especially during drought conditions. When watering broccoli, remember not to get the developing heads wet. Cauliflower plants need constant growth to mature properly. Interrupted growth caused by dry conditions can cause premature development of the cauliflower head or even ruin the plant entirely.